Returning to its roots, Sprecher taproom will be in old facility of failed Brenner Brewing. Brenner Brewing. Photo by Joey Grihalva. Last Thursday, Jeff Hamilton, the president of Sprecher Brewery, approached his counterpart, Russ Klisch of Lakefront Brewery, with a bit of news while they both attended the City of Milwaukee Birthday Party at the Grain Exchange Room. Sprecher would be opening a taproom at the site of the former Brenner Brewing facility at 706 S. 5th St., he announced. The new spot would be in Walker’s Point, a familiar neighborhood for Sprecher, which, as its labels state, was “Established in Milwaukee, 1985.” That’s when Randy Sprecher opened Milwaukee’s first brewery since the repeal of Prohibition, which he located at the Pfister & Vogel complex, 710 W. Oregon St. Even while the very first tank of Black Bavarian Lager was fermenting, Sprecher had somebody climb the chimney of the old tannery to paint his firm’s distinctive black-and-yellow logo. It’s still there, although the brewery relocated to Glendale in 1994. 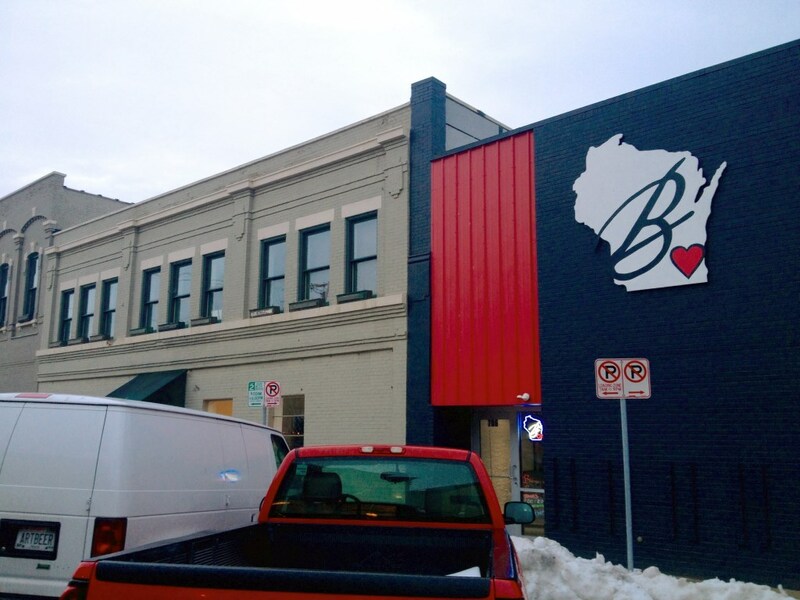 Sprecher’s taproom will occupy the space vacated by Brenner Brewing Co. last November. Artist/Entrepreneur Mike Brenner earned an M.B.A. from UW-Milwaukee in 2010 with his business model for a brewery. He followed that with master brewing studies in Chicago and Berlin, returning to America to raise quite a good sum of money for his dream brewery, which he chose to locate in 2014 in a building without floor drains or much in the way of insulation. The 6,900-square-foot concrete block building, constructed in 1980, has an estimated rental rate of $4.52 per square foot, or a little over $31,000 per year. This expense contributed to his decision to close, Brenner said, along with a number of factors, including difficulty in getting his beers on tap in local taverns. At its height, Brenner produced no more than 50 barrels of beer a month. In October he produced 20. It was down to eight in November. Whatever the volume, it was nowhere near matching the debt service. Customer continues to reconnect steam service to building after being locked out. Possible damage to steam piping and creating a hazard. In a telephone interview Monday, Hamilton expressed enthusiasm about the brewery’s return to Walker’s Point, at least in name. In addition to its main facility, “we are permitted to have one tap room by law,” Hamilton said, referring to an exception in the State of Wisconsin‘s Alcohol Beverage statutes allowing a manufacturer to sell beer directly to retail clients at the brewery premises — or at no more than one additional outlet. Hamilton does not expect to brew beer at the new facility. In a Milwaukee Journal Sentinel article, he referred somewhat cryptically to the accouterments left behind by Brenner: “It’s a pretty large system there for the supporting equipment,” he said. Hamilton, in his Urban Milwaukee interview, also said there are no immediate plans to use the space for brewing, adding that the existing brewery has sufficient capacity. In fact, the majority of Sprecher’s brewing capacity is devoted to the manufacture of non-alcoholic soda, which the firm has produced since 1988. Sprecher beer production last October and November totaled 572 and 632 barrels respectively, compared to 2,020 and 1,035 in the same months of 2014. Lakefront has long since surpassed Sprecher as the largest Milwaukee craft brewery, with the production of 4,060 barrels in October and 3,987 in November. Hamilton eyes the new location as a spot to show off Sprecher memorabilia, and to feature the company’s beers. “Tasting flights,” which have hardly been a South Side tradition, will feature the company’s different beers. Flights might be designed around the brewery’s previous medal winners, he said. The facility will have a soft opening in mid-February, Hamilton said. The facility will not require a City of Milwaukee license due to its connection with the brewery. “Brewpub planned at Milwaukee Brewing Co.’s new facility at downtown former Pabst complex,” read the headline in the Milwaukee Journal Sentinel on January 18th over a story by Tom Daykin. A brewpub, operated by Pizza Man restaurants’ owners, will be part of Milwaukee Brewing Co.’s new development at downtown’s former Pabst complex. The brewpub, which isn’t yet named, would include a large room for weddings, corporate meetings and other events, said Scott Lurie, who owns the building. According to state law, a brewpub is a strictly defined term, with considerable limitations placed on the operators. Among them is the presumption that beer would be brewed on the premises. The Milwaukee Brewing Company facility is a brewery by legal definition, and it would not be able to operate a brewpub. It is also unlikely that Lurie and his 19 partners of Bull & A Boy, LLC, which is developing the property for the brewery would simultaneously have a rival operator establish a brewpub right next door, separated only by a glass wall. However, Daykin tells me that Lurie himself used the term brewpub, apparently somewhat loosely, when he appeared to request a $500,000 loan from the Milwaukee Economic Development Corporation for the $3,000,000 project on January 18th. Description: The loan request will be used to purchase restaurant equipment for a new restaurant that will be related to the new Milwaukee Brewing Company facility. The restaurant will be run by the same management group that owns/runs The Pizza Man restaurants. Furniture and equipment purchases for the new restaurant will represent $2.5 million of the investment, with $500,000 devoted to providing working capital. None of the 20 partners holds more than 20 percent of the investment. That’s an awful lot of chefs in the kitchen of the new restaurant. This operation will require a Class “B” Tavern License to be granted by the city. The new MKE Brewery will supplement the company’s S. 2nd St. facility in Walker’s Point. Production there in October and November was 886 and 750 barrels respectively, which is approximately the same as its 2014 production for the same months. The majority of the cost of the Brenner setup is in the equipment. The tasting area was thrown together with plywood and black paint. There are other vacant spots in walkers point. I don’t see how this works out for sprecher in the end without them using the equipment to produce interesting beers that draw in people. Special Amber just doesn’t cut it today. Right. They’ve got to up their product for sure. I usually buy any new beers by them, with the hopes that I’ll like it. I think Special Amber is their strongest beer. It’s the Spotted Cow appeal. Good enough to drink and not interesting enough to scare people away. Anyway, I hope them all the success in the world, they’re a Milwaukee institution. Their Triple Abbey and Black Bavarian are great beers! I wish them luck in their new(est) location. That is definitely becoming a jumping area! Hey beer geek, get to know sprecher beers, it’s not just about amber and black anymore. They don’t do a good job in telling the craft beer buying public what great beers they have. Stop buy the tap room and find out for yourself. Brenner’s was a tasteless off-key presence on 5th. An “artist”? Zero aesthetic.